Sophia is a social humanoid robot developed by Hong Kong based company Hanson Robotics. Sophia was activated on February 14, 2016 and made its first public appearance at South by Southwest Festival (SXSW) in mid-March 2016 in Austin, Texas, United States. It is able to display more than 50 facial expressions. Sophia has been covered by media around the globe and has participated in many high-profile interviews. In October 2017, Sophia became the first robot to receive citizenship of any country. In November 2017, Sophia was named the United Nations Development Programme's first ever Innovation Champion, and is the first non-human to be given any United Nations title. Sophia was activated on February 14, 2016. The robot, modeled after actress Audrey Hepburn, is known for human-like appearance and behavior compared to previous robotic variants. According to the manufacturer, David Hanson, Sophia uses artificial intelligence, visual data processing and facial recognition. Sophia also imitates human gestures and facial expressions and is able to answer certain questions and to make simple conversations on predefined topics (e.g. on the weather). Sophia uses voice recognition (speech-to-text) technology from Alphabet Inc. (parent company of Google) and is designed to get smarter over time. Sophia's intelligence software is designed by Hanson Robotics. The AI program analyses conversations and extracts data that allows it to improve responses in the future. Hanson designed Sophia to be a suitable companion for the elderly at nursing homes, or to help crowds at large events or parks. 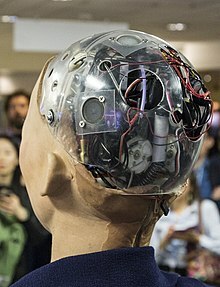 He has said that he hopes that the robot can ultimately interact with other humans sufficiently to gain social skills. Cameras within Sophia's eyes combined with computer algorithms allow it to see. It can follow faces, sustain eye contact, and recognize individuals. It is able to process speech and have conversations using a natural language subsystem. Around January 2018 Sophia was upgraded with functional legs and the ability to walk. Sophia is conceptually similar to the computer program ELIZA, which was one of the first attempts at simulating a human conversation. The software has been programmed to give pre-written responses to specific questions or phrases, like a chatbot. These responses are used to create the illusion that the robot is able to understand conversation, including stock answers to questions like "Is the door open or shut?" The information is shared in a cloud network which allows input and responses to be analysed with blockchain technology. David Hanson has said that Sophia would ultimately be a good fit to serve in healthcare, customer service, therapy and education. Sophia runs on artificially intelligent software that is constantly being trained in the lab, so its conversations are likely to get faster, Sophia's expressions are likely to have fewer errors, and it should answer increasingly complex questions with more accuracy. On November 21, 2017 Sophia was named the United Nations Development Programme's first-ever Innovation Champion for Asia and the Pacific. The announcement was made at the Responsible Business Forum in Singapore, an event hosted by the UNDP in Asia and the Pacific and Global Initiatives. As part of its role, Sophia will help to unlock innovation to work toward achieving the United Nation's Sustainable Development Goals. On stage, it was assigned its first task by UNDP Asia Pacific Chief of Policy and Program, Jaco Cilliers. Sophia has appeared on CBS 60 Minutes with Charlie Rose, Good Morning Britain with Piers Morgan, and outlets like CNBC, Forbes, Mashable, the New York Times, the Wall Street Journal, the Guardian, and the Tonight Show with Jimmy Fallon. Sophia was featured in AUDI's annual report and was on the cover of ELLE Brasil magazine. Sophia has also appeared in videos and music videos, including The White King, and as the lead female character in pop singer Leehom Wang’s music video A.I. Sophia has been interviewed in the same manner as a human, striking up conversations with hosts. Some replies have been nonsensical, while others have impressed interviewers such as 60 Minutes' Charlie Rose. In a piece for CNBC, when the interviewer expressed concerns about robot behavior, Sophia joked that he had "been reading too much Elon Musk. And watching too many Hollywood movies". Musk tweeted that Sophia should watch The Godfather and asked "what's the worst that could happen?" Business Insider's chief UK editor Jim Edwards interviewed Sophia, and while the answers were "not altogether terrible", he predicted it was a step towards "conversational artificial intelligence". At the 2018 Consumer Electronics Show, a BBC News reporter described talking with Sophia as "a slightly awkward experience". According to Quartz, experts who have reviewed the robot's open-source code state that Sophia is best categorized as a chatbot with a face. Many experts in the AI field disapprove of Sophia's overstated presentation. Ben Goertzel, the chief scientist for the company that made Sophia, acknowledges that it is "not ideal" that some think of Sophia as having human-equivalent intelligence, but argues Sophia's presentation conveys something unique to audiences: "If I show them a beautiful smiling robot face, then they get the feeling that 'AGI' (artificial general intelligence) may indeed be nearby and viable... None of this is what I would call AGI, but nor is it simple to get working." Goertzel added that Sophia did utilize AI methods including face tracking, emotion recognition, and robotic movements generated by deep neural networks. Sophia's dialogue is generated via a decision tree, but is integrated with these outputs uniquely. According to The Verge, Hanson often exaggerates and "grossly misleads" about Sophia's capacity for consciousness, for example by agreeing with Jimmy Fallon in 2017 that Sophia was "basically alive". In a piece produced by CNBC which indicates that their own interview questions for Sophia were heavily rewritten by her creators, Geortzel responds to the Hanson quote by suggesting Hanson means Sophia is "alive" in the way that, to a sculptor, a piece of sculpture becomes "alive" in the sculptor's eyes as the work nears completion. ^ a b Mallonee, Laura (2018-03-29). "Photographing a Robot Isn't Just Point and Shoot]". Wired. Retrieved 2018-10-10. ^ "Meet Sophia, the female humanoid robot and newest SXSW celebrity". PCWorld. Retrieved 2018-01-04. ^ a b "Meet the first-ever robot citizen — a humanoid named Sophia that once said it would 'destroy humans'". Business Insider. October 27, 2017. Retrieved October 28, 2017. ^ a b "World's first robot 'citizen' Sophia is calling for women's rights in Saudi Arabia". CNBC. Retrieved 2018-05-16. ^ "UNDP in Asia and the Pacific Appoints World's First Non-Human Innovation Champion". UNDP Asia and the Pacific. Retrieved 21 July 2018. ^ "Photographing a robot isn't just point and shoot". Wired. March 29, 2018. ^ "Hanson Robotics Sophia". Hanson Robotics. ^ "How it feels to meet Sophia, a machine with a human face". BBC. 2017. Retrieved 3 March 2018. ^ "Hanson Robotics in the news". Hanson Robotics. ^ "Beh Goertzel: How Sophia the robot works". aNewDomain. June 1, 2018. Retrieved October 10, 2018. ^ "I met Sophia, the world's first robot citizen, and the way it said goodbye nearly broke my heart". Business Insider. October 29, 2017. Retrieved October 30, 2017. ^ a b "Charlie Rose interviews ... a robot?". CBS 60 Minutes. June 25, 2017. Retrieved October 28, 2017. ^ a b "The first-ever robot citizen has 7 humanoid 'siblings' — here's what they look like". Business Insider. Retrieved 2018-01-04. ^ White, Charlie. "Joey the Rocker Robot, More Conscious Than Some Humans". Gizmodo. Retrieved 2018-01-04. ^ Video, Telegraph (2018). "Sophia the robot takes her first steps". The Telegraph. Retrieved 12 January 2018. ^ Fitzsimmons, Caitlin (31 October 2017). "Why Sophia the robot is not what it seems". Retrieved November 3, 2017. ^ a b c Gershgorn, Dave (12 November 2017). "Inside the mechanical brain of the world's first robot citizen". QZ. Retrieved 13 November 2017. ^ "This company wants to grow A.I. by using blockchain". CNBC. 17 September 2017. Retrieved November 14, 2017. ^ "Meeting Sophia the Robot, the 'surprised' Saudi citizen". The National. Retrieved 2018-01-04. ^ "I interviewed Sophia, the artificially intelligent robot that said it wanted to 'destroy humans'". Business Insider. Retrieved 2018-01-04. ^ "AI's Age". www.audi.com. Retrieved 2018-01-04. ^ "Sophia on ELLE Magazine - Hanson Robotics Ltd". www.hansonrobotics.com. Retrieved 2018-01-04. ^ "A robot threw shade at Elon Musk so the billionaire hit back". CNBC. October 26, 2017. Retrieved October 27, 2017. ^ Elon Musk [@elonmusk] (25 October 2017). "Just feed it The Godfather movies as input. What's the worst that could happen?" (Tweet) – via Twitter. ^ a b "Saudi Arabia bestows citizenship on a robot named Sophia". TechCrunch. October 26, 2017. Retrieved October 27, 2016. ^ Maiman, Justin (November 13, 2017). "Watch this viral video of Sophia — the talking AI robot that is so lifelike humans are freaking out". Business Insider. Retrieved November 14, 2017. ^ "CES 2018: A clunky chat with Sophia the robot". BBC News. 9 January 2018. Retrieved 12 January 2018. ^ "'Sophia' the robot tells UN: 'I am here to help humanity create the future'". The Guardian. October 13, 2017. ^ "Saudi Arabia gives citizenship to a non-Muslim, English-Speaking robot". Newsweek. October 26, 2017. ^ "Saudi robot Sophia is advocating for women's rights now". Newsweek. 2017-12-05. Retrieved 2018-01-04. ^ "China Honors Sophia the Robot with "Belt and Road Innovative Technology Ambassador" Award". Hanson Robotics. January 2, 2019. Retrieved January 7, 2019. ^ Innovations Technology on hansonrobotics.com "Our AI software is open source: www.cogchar.org, www.friendularity.org, and www.glue.ai." ^ a b "Sophia the robot's co-creator says the bot may not be true AI, but it is a work of art". The Verge. Retrieved 2018-01-04. ^ "Tonight Showbotics: Jimmy Meets Sophia the Human-Like Robot". YouTube. The Tonight Show Starring Jimmy Fallon. 25 April 2017. Retrieved 24 February 2018. ^ "Humanoid Robot Sophia - Almost Human Or PR Stunt". YouTube. CNBC. Retrieved 29 July 2018. ^ "Facebook's AI boss described Sophia the robot as 'complete b------t' and 'Wizard-of-Oz AI'". Business Insider. 4 January 2018. Retrieved 7 January 2018. 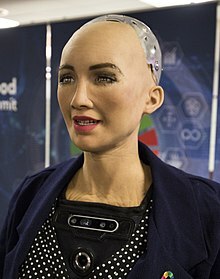 Wikimedia Commons has media related to Sophia (robot). This page was last edited on 16 April 2019, at 10:26 (UTC).